BIKEPOOLS:The concept is simple – meet up with BikeFriday organizers in groups and ride to work together. Biking to work can sometimes be dangerous – but it’s safer when you ride with other people. Artscape is please to invite you to the 5th Annual Queen West Art Crawl. The West Art Crawl Launch Party happening at the Gladstone Hotel on Friday, September 14, starting at 7pm! Various locations throughout Parkdale will be participating in PLAY/GROUNDS’; site specific installations and performance art taking place in the community of Parkdale, with artists using empty store fronts, vacant lots and parks as satellite locations for installations that engage and interact with passers-by. Come out, enjoy some great music and a chance to win some exciting prizes! Please see below for more information on service level adjustments related to the cost containment measures announced on August 10th, 2007. I am also including my personal thoughts on the cost containment measures that I posted in July. As I mentioned, I hope to meet with all of the Resident Associations in the month of September to talk about these measures and the revenue tools in more detail. I will continue to keep you updated. Visit http://www.toronto.ca/involved/projects/waterfront_transit/index.htm for more information. An updated version of the proposed line is below, in PDF format. I look forward to seeing you on August 13th! Council voted 23-22 to defer a decision on implementation of two new taxes until the October 22 Council meeting. The City is facing a $575 million funding shortfall for 2008, having exhausted its reserves and one-time fixes to meet a balanced budget as required by provincial law. The ability for the City to raise new revenue was granted through the City of Toronto Act, and two new taxes were introduced for consideration at this meeting: a land transfer tax, and vehicle registration fee. The climate change and sustainability plan was passed by a unanimous vote of Council. Under the plan the City commits to meeting Kyoto emissions target reductions of 6% by 2012, stepping that up to 30% by 2020 and 80% by 2050. Council endorsed the creation of the $42 million Toronto Energy Conservation Fund, which will promote energy savings initiatives in city buildings, as well as schools and hospitals. 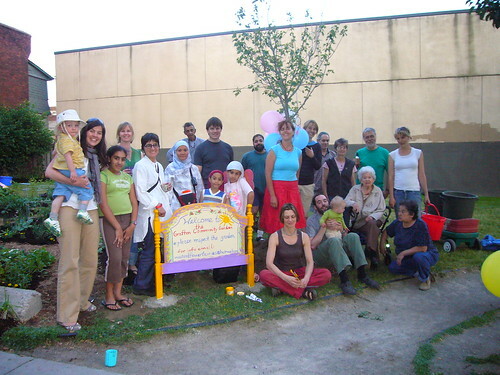 The City will obtain 25% of its electricity from green energy sources starting in 2008, and establish the Live Green Toronto program that will help community and residents’ groups green their neighbourhoods through a series of initiatives, including green roof projects, community gardens, and water conservation programs. Implementation of the People, Dogs and Parks — Off-leash Policy will begin this fall, and will expand the number of off-leash areas in City parks. This week I had the pleasure of visiting the Grafton Community Garden, a space that my office has been working to help create for the last 6 months. Although the praise for securing materials for the garden was most appreciated, I think that a more important thing to highlight at this garden is the way in which it has engaged the community. To best capture the community that has grown around this garden I have requested that Carolin Taron, garden coordinator, share a composition. Enjoy! On July 14th I walked with the community to celebrate Mad Pride; an internationally recognized and locally endorsed event committed to raising awareness about the marginalization of psychiatric survivors and consumers. 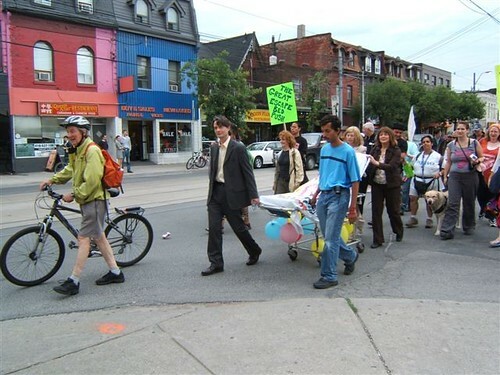 Together we marched from CAMH to the Parkdale Activity-Recreation Centre pushing a gurney to symbolize the Mad People’s escape from the institution in a safe, celebratory and accepting space.